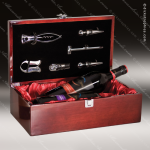 This Rosewood Double Bottle Wine Box makes a great personalized gift. In addition to the elegant Satin Rosewood finish, these boxes are appointed with gold tone hinges with matching closure latch, satin and foam fitted area to securely hold the wine bottle. 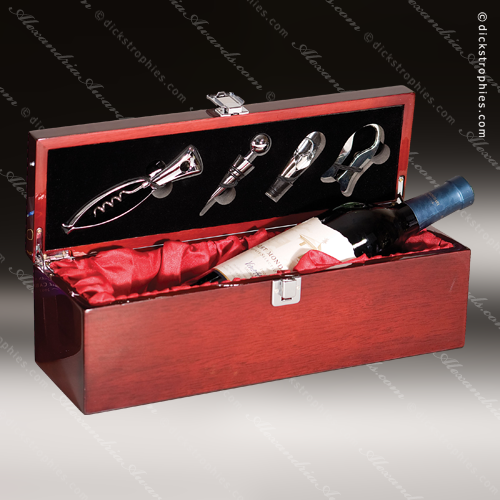 The foam cut-out on the lid holds the following included items Stainless Steel Hippocampal Knife, a Silver and Plastic / Paper Cutting Knife, a Stainless Steel Wine Pourer, a Mercurial Thermometer and 2 corks. A Single bottle version is also available. 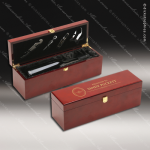 With an overall box dimensions of 4-3/4" X 14-1/4" X 8" this box can be personalized to fit any of your recognition needs. This Rosewood Single Bottle Wine Box makes a great personalized gift. 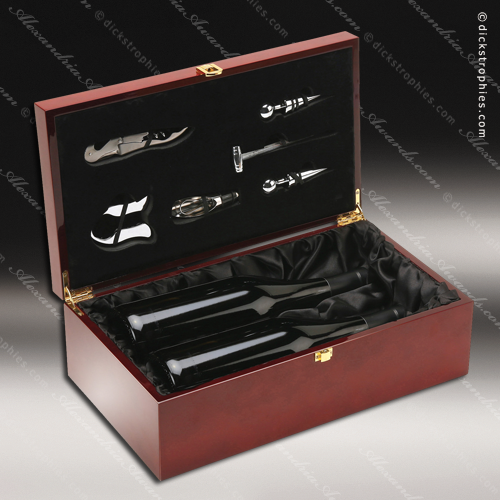 In addition to the elegant Satin Rosewood finish, these boxes are appointed with gold tone hinges with matching closure latch, satin and foam fitted area to securely hold the wine bottle. 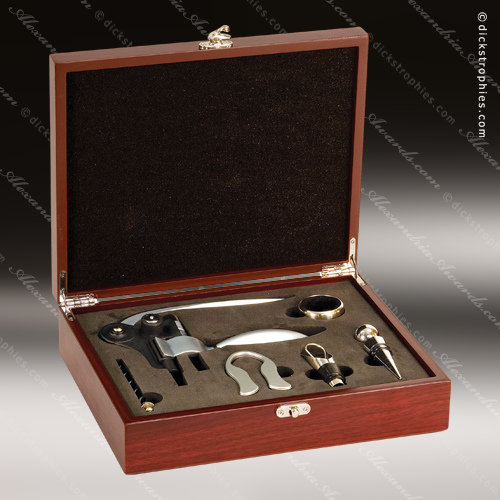 The foam cut-out on the lid holds the following included items Stainless Steel Hippocampal Knife, a Silver and Plastic / Paper Cutting Knife, a Stainless Steel Wine Pourer and a cork. A Two bottle version is also available. 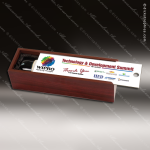 With an overall box dimensions of 4-3/4" X 14-1/4" X 4-1/8" this box can be personalized to fit any of your recognition needs. 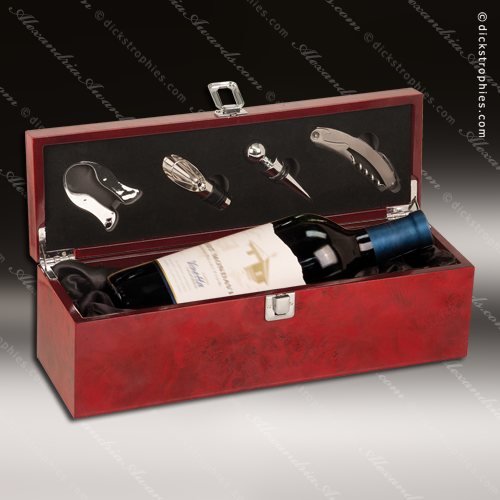 This wine box makes a great incentive, promotional item or personalized gift. 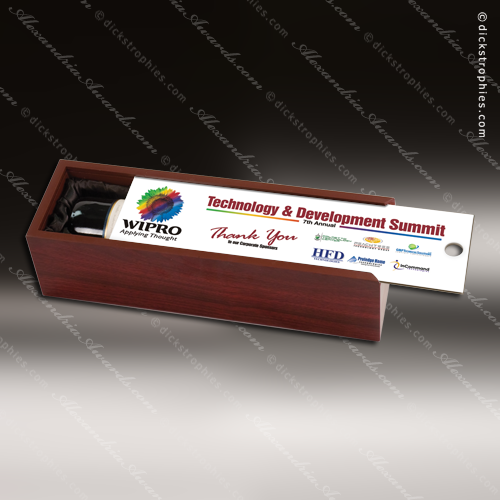 The lid slides off and can be imprinted with full color graphics. 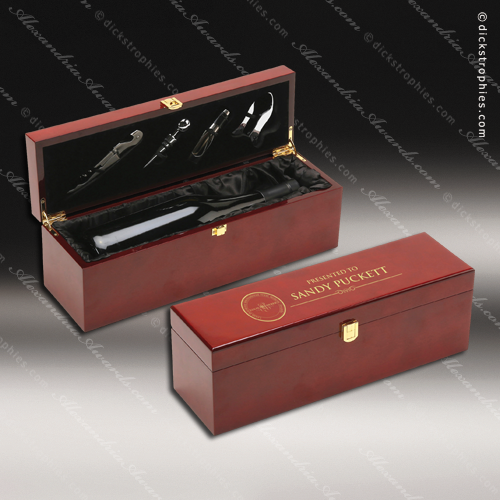 The box is finished in a stunning rosewood, padded and lined in black satin to protect the wine bottle. 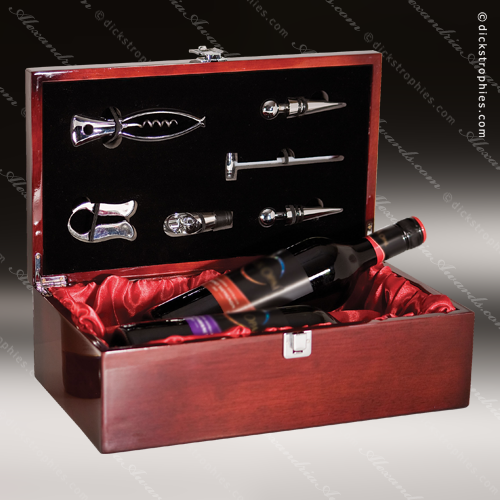 With your customization, this elegant wine box is a truly unique, one of a kind item.